So for the first time we got to pack a packed lunch in one of these boxes (which btw are very well made – Hubby will write a review of them later on at the weekend). The little dipper filled with a balsamic vinagrette dressing (olive oil and balsamic vinegar) with some home-cooked pastured ham slices below it. A square of 85% cocoa solid chocolate in the center treat container. I took the picture of the lunch before putting the lids on both the big and little dippers. While this lunch may seem a little light on the protein, I am not too worried – there will be enough here to keep them full until they get home, and they had a really good breakfast (sausage patty, fried eggs and rutabaga hash-browns). Plus dinner is also going to be protein rich (pulled pork in lettuce wraps). I believe in looking at the nutrients consumed in the entire day rather than focusing on one single meal. A made her own lunch. She put mixed berries in the big dipper and some balsamic vinegar to drizzle over the berries in the little dipper (she can be a little bit of a gourmet at times! 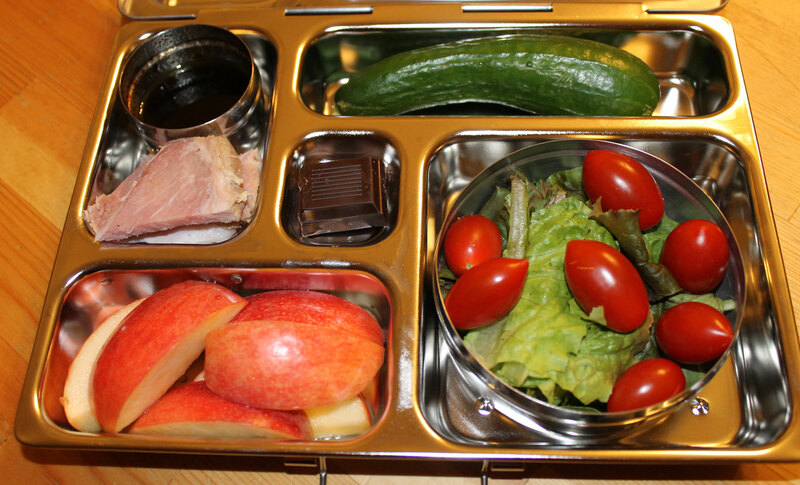 ), She also sliced up an apple and took some ham, and she put a baby cucumber in the long section. She declined to take the square of dark chocolate and ate it there and then. I am at home all day today, so my lunch is not being packed. This entry was posted in School lunches and tagged gluten-free, grain-free, healthy, kids packed lunch, lunch box, packed lunch, paleo, primal, school lunch. Bookmark the permalink. love them!! tell me they are in Australia too. What company makes them? Maybe I can import them here if they are not in my country. I bought them direct from Planet Box I believe they ship to Australia. They certainly shipped them to Canada for me.